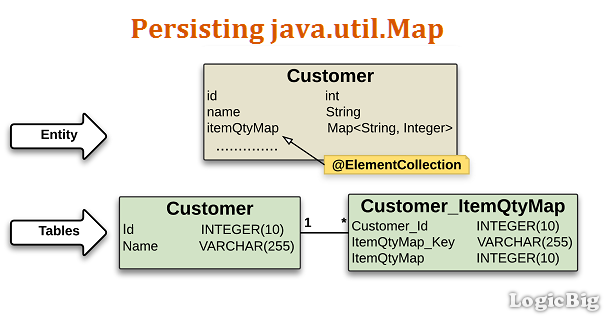 To persist a java.util.Map having keys/values of basic Java types, the annotation @ElementCollection is used. This annotation is placed on the map reference in the entity class. This usage of @ElementCollection is very similar to java.util.Collection mapping. The Entity and the map are persisted to two separate foreign/primary-key tables. One for the entity and other for the map. The keys and values of the map are persisted to two separate columns in the map table. Also there is a foreign key column in the map table, pointing to the primary key of the entity. By default, JPA specific naming conventions are used for the mapping. To customize that, we can use @MapKeyColumn, @CollectionTable and @Column annotations (next tutorial) on the map field/property.